“Netsweeper is excited to be partnering with Loadbalancer.org. The combined technical solutions of Netsweeper and Loadbalancer.org will allow customers and partners to utilize the best of breed technologies to effectively and efficiently manage their complex network requirements while reducing over implementation and provide cost savings”. Lou Erdelyi, CTO, Netsweeper Inc.
Loadbalancer.org is a cost-effective and reliable load balancing appliance that is manufactured to help improve the quality of organization’s most vital IT applications. 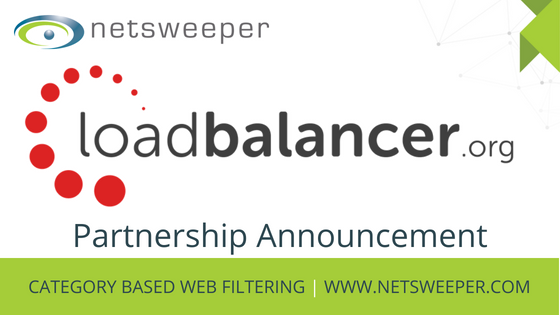 Netsweeper is excited to announce our partnership with Loadbalancer.org, as it will allow our software to be more effectively deployed in a cluster, thus improving the overall efficiency of the Netsweeper solution. Performance – For enhanced performance, additional Netsweeper’s can be easily added to the cluster. In order to provide customers with optimal efficiency, we have partnered with Loadbalancer.org to offer multiple deployment types. Explicit Mode – proxy settings are explicitly set on each client device. Browser settings on client PCs must be changed to point at the Virtual Service (VIP) on the load balancer. Transparent Mode – policy-based routing is used on the router/firewall that handles client traffic. These rules at the router/firewall make sure that the required traffic (typically HTTP & HTTPS on port 80 & 443) is sent transparently to the load balancer. Non-Transparent Mode – proxy settings are explicitly set on each client device. Browser settings on client PCs must be changed to point at the Virtual Service (VIP) on the load balancer. Netsweeper has been working closely with Loadbalancer.org to build a customized offering to meet your needs. To learn more about the Netsweeper and Loadbalancer.org offering contact your regional account executive or click here to request more information.